The fried fish recipe is favorite for all fish lovers. So here is yet another tasty fried fish recipe which is a very popular fish recipe. 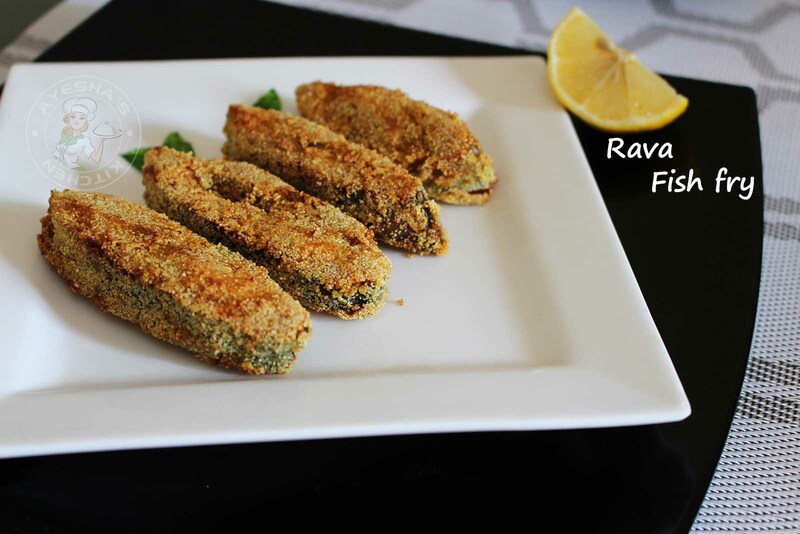 Rava fish fry/semolina fish fry - well-marinated fish is coated with semolina or rava and then shallow fried over a medium flame results in a crispy exterior and moist tender inside. I used to fry fish in many ways. 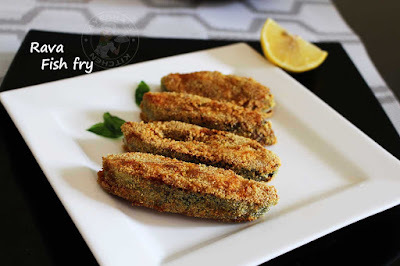 As am a fried fish lover, I love experiments in such fried fish recipes. The marination of fish depends on ones' taste and preference only. Here I prefer mildly spiced but you can add more chili powder or crushed chilies in the marination if you prefer heat. This is, an easy to make fish fry recipe and so I skipped the use of ginger garlic paste. You can make this fried fish batter quickly. As fried fish is considered as an important food in many cuisines, there are many varieties of fried fish recipes from around the world. Some prefer frying the marinated fish, some covered this marinated fish in batter or flour or herbs and then fry, some prefer deep frying while some shallow fry, some grill the fish without any spices other than vinegar and salt etc. 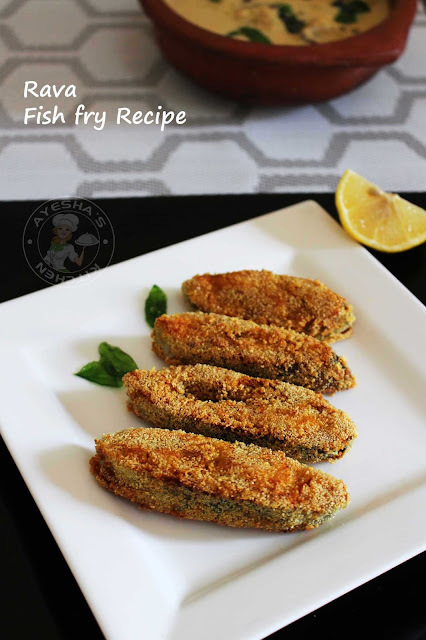 Here is my recipe showing how to make restaurant style rava fish fry / rava fried fish/semolina fish fry / Mangalorean fish fry / easy fish batter /deep fried fish batter recipe /batter fried fish/ how to fry fish with semolina. Clean the fish well and make thin slices. If you are using small fish like anchovy (netholi), then skip making thin slices. Drain the excess water. Make a thick marinade with the ingredients given under for fish marination. Marinate the fish with this marinade on both sides using a spoon. Keep it aside for 30 minutes. Heat oil in a non-stick pan for shallow frying the fish. Once hot, make the flame to medium-low (very important). Take a marinated fish, coat it well with semolina / rava, tap out the excess and drop it into the oil. You must fry this marinated and semolina coated fish in a medium flame only or else the outer crust of fish will get fried soon leaving an uncooked inner. Flip both sides occasionally until both sides are done. Serve hot. Really yummy with a flavorful crispy crust.